New York - The Health Department today announced it has issued Commissioner’s Orders to all yeshivas in Williamsburg affected by the school exclusion mandate. This means that any school out of compliance will immediately be issued a violation. In December, the Health Department ordered yeshivas and childcare centers serving the Orthodox Jewish community in the affected ZIP codes in Brooklyn to exclude all unvaccinated students from attending school or daycare until the outbreak is declared over. In January, one yeshiva in Williamsburg fell out of compliance with the Department’s exclusion mandate, allowing unvaccinated children back into school or daycare. 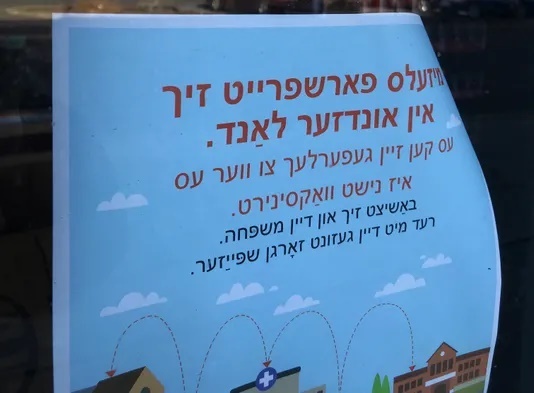 This single yeshiva is connected to more than 40 cases, resulting in a large increase in measles cases and the continuation of the outbreak. The Health Department has since issued Commissioner’s Orders to all yeshivas in Williamsburg to comply with the mandatory exclusion of unvaccinated children or face violations subject to fines and possible school closure. The measles outbreak in the Orthodox Jewish community continues to increase at an alarming rate. To date, 285 cases have been confirmed since the beginning of the outbreak in October, with many of these new cases being confirmed in the last 2 months. The vast majority of cases are children under 18 years of age (246 cases), and 39 cases are adults. Most of these measles cases were unvaccinated or incompletely vaccinated individuals. There have been no deaths associated with this outbreak, although there have been complications, including 21 hospitalizations and five admissions to the intensive care unit. Ahead of Passover, the Health Department is urging all New Yorkers—especially those in the Orthodox Jewish community—to get the measles-mumps-rubella (MMR) vaccine to prevent further spread of the virus. Individuals traveling to areas with ongoing large outbreaks, including Israel, Europe, Upstate New York, and other parts of the United States should make sure they and their children are appropriately vaccinated with MMR. Most cases have been reported from Williamsburg and Borough Park, Brooklyn. Five cases, including the initial case of measles, were acquired on a visit to Israel, where a large outbreak of the disease is occurring. Two people contracted measles from the U.K. and one from Ukraine. Measles is a highly contagious disease and can cause pneumonia, encephalitis (swelling of the brain), and death. Measles is easily preventable with the safe and effective MMR vaccine. Newborns, pregnant individuals, and those with weakened immune systems cannot get vaccinated, so it is important that everyone around them be vaccinated in order to protect them from contracting the virus which can have severe complications in these susceptible populations. While the MMR vaccine is the safest and most effective method of prevent measles, it is only 97 percent effective, so population wide immunity is a key component to protecting our most at risk New Yorkers from measles. Pregnant women – even if they have received the MMR vaccine – are still at risk of complications including birth defects or loss of pregnancy. In February, the Department expanded vaccination recommendations for providers serving the Orthodox Jewish community to include an early, extra dose of the MMR vaccine for children between the ages of 6 months to 11 months who live in Williamsburg and Borough Park. Measles can be prevented through vaccinations. New Yorkers should call 311 to access a list of facilities that can provide MMR at low or no cost. There are large outbreaks of measles in Europe and Israel, as well as in countries in South America, Africa, and Asia. New Yorkers should make sure they have been vaccinated with MMR vaccine before traveling to Europe or Israel. Infants ages 6 to 11 months should also be vaccinated prior to international travel. New Yorkers who believe they were exposed to measles or who have symptoms of measles should contact their health care provider before seeking care to prevent exposure to other patients. For more information, New Yorkers can visit the Health Department’s Measles page. The Yeshivas will ignore this, just as they ignore every other edict from the secular government that they feel do not benefit them. Hey shmegeg, see you in the Emergency Room. Keep reading the evangelical xtian anti-medicine website junk. Talk in tongues and handle some snakes while you're at it. What type of wacko website are you referring to? This is the precise reason why so many people fall for fake news! You bring some cockamaney website and tout is as facts. You are allowed to have your opinion, you are not allow to have your facts. I suspect #1 is right. As for #2, the moderators have simply given up and allow most anything to be posted. What is the point of this. I never heard of anyone claiming that vaccines are 100% safe and no one will ever be harmed by them. Rather, they are better than the alternative and help save many lives and avoid various chronic conditions. The more people vaccinate the more effective a vaccine is, so by people choosing to not vaccinate they are making it worse for the vast majority that does vaccinate. I get it, some choose not to vaccinate as they are concerned that vaccines are not 100% safe. But reality is that little in life is 100% safe. Drinking water can have germs that kill, but you still drink it as you realize the necessity. Vaccines are safe when compared to the alternatives. Vaccinating is part of being a good member of a community. Not vaccinating is being self-centered. As to why there are payouts, it is because vaccines are not, as nothing in life is, 100% safe and when people are injured they may have legal cause to sue or get compensation. A great example of Fake News. Bad science, cherry picked statements, and lots of spin. Nobody says vaccines are perfectly safe. Courts are not a good place to determine science. Awards are not a good way to track risk. Vaccinations save lives. Andrew Wakefield will have a special place in gehenim for what he has wrought. “ A great example of Fake News. No sane and educated person believes that vaccines are 100% safe. It is obvious now that they are not always effective. Imagine your child, born as a typical child then regressing in the days and weeks after his MMR. There is no explanation but everybody (especially VIN posters) knows it is not the vaccine. I wish I had known more and waited till 24 months to have my son get his MMR. There was no epidemic at that time and the risk might have been minimal. At least Wakefield tried to do research. Closing the door to research is never smart. Since you do mention Wakefield, why don't you read up and find out what he really did wrong. ps, it has more to do with lack of consent than fraud. Oh yes, there was money involved, just as the head of the US agency that regulates vaccines pushes his agency to not halt his vaccine even when it was contaminated. Since you and people like you know so much, try to volunteer for a week at any agency caring for these kids, they are al over the place. These are kids that evolved to abnormal after their MMR, for some reason. Most of them have a history of weakened immune sytem and constant ear infections only after the MMR. You are 100% right, and it would be evil to make it unlawful choosing not to drink of that water, such decision must be volunteery, communism is based on enforcing policy on the individual for the common good, and you end up in gulags. I'm sorry to disagree but there is a reason court decisions are always brought up, Courts are the perfect place Since they won't award you anything without proof and evidence. Not that it is germane, but, what court decision are you referring to. By the way, I have found that courts can be wrong, appealed, overturned etc. It really depends on who runs out of funds first. Mr Chasid, since you seem to know so much, try to volunteer rather than judge. By the way, after College I had 4 years of additional Biological sciences training, countless continuing edication courses and lots of attention to immune system studies. I feel that I know enough to state that I don't know what is going on with the MMR, you don't know either, and the true answer will not come from a Judge in a courtroom. Since research in the USA is never funded if it plans to look at this angle, the mystery will not be solved in the USA. You wwill note that I never suggested skipping the MMR and if it is not risky, maybe earlier is better than 18 months. My daughter avtually had it at 7 months, prior to travelling to Israel.